Formed in Boston in 1970 Aerosmith have long been recognized as one of America's foremost rock acts. By the mid 1980s their albums had spent well over 400 weeks on the Billboard charts with their most successful, 'Rocksmaking' No.3 in 1976. Singles like 'Dream On', 'Sweet Emotion' and 'Walk This Way' were and are staples of American FM radio stations who believed when it was time to rock it was time for Aerosmith. 1987's 'Permanent Vacation' became the band's best selling album in a decade helped in no small part by 'Angel', a single that climbed to No.3 on the Hot 100 in early 1988. 'Dude (Looks Like a Lady)' and 'Rag Doll', both taken from the album also featured in the Billboard Top 20. 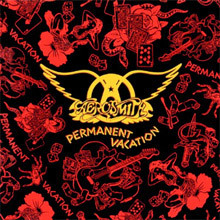 Permanent Vacation, which sold 5 million copies in America, proved to be a turning point for Aerosmith. It was the first time that they employed outside songwriters, which when coupled with their MTV-friendly videos took them to another level. In the UK 'Dude (Looks Like a Lady)' became their first record to make the singles chart, which helped 'Permanent Vacation' make the Top 40. Two years later Pump did even better making No.5 in America, staying on the charts for over two years, and No.3 in the UK. 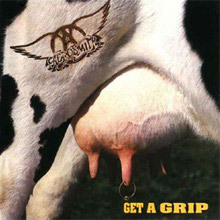 Europe's love affair with Aerosmith continued when Get A Grip went to No.2 in Britain and top 5 across Europe. From this era, 'Love is an Elevator', 'Janie's Got A Gun', 'Cryin' and Crazy' just added Aerosmith to more rock radio playlists and helped ensure they are reagrde as one of the greatest ever rock bands to come out of America. Pump , released in 1989, continued the band's winning streak, reaching number five, selling over four million copies, and spawning the Top Ten singles "Love in an Elevator," "Janie's Got a Gun," and "What It Takes." 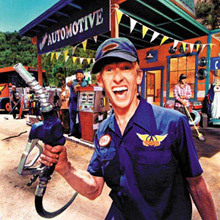 Aerosmith released Get a Grip in 1993. Like Permanent Vacation and Pump, Get a Grip was produced by Bruce Fairbairn and featured significant contributions by professional songwriters. The album was as successful as the band's previous two records, featuring the hit singles "Livin' on the Edge," "Cryin'," and "Amazing." 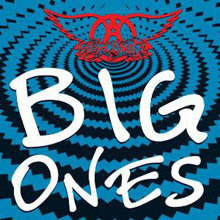 In 1994, Aerosmith released Big Ones, a compilation of hits from their Geffen years that fulfilled their contract with the label; it went double platinum shortly after its release. Under such circumstances, recording became quite difficult, and when Nine Lives finally appeared in the spring of 1997, it was greeted with great anticipation, yet the initial reviews were mixed and even though album debuted at number one, it quickly fell down the charts. The live A Little South of Sanity followed in 1998. Next up for the band was a blues album, Honkin' on Bobo, released in 2004, along with two live album/DVDs, You Gotta Move and Rockin' the Joint. Another greatest-hits collection, Devil's Got a New Disguise: The Very Best of Aerosmith arrived in 2006. 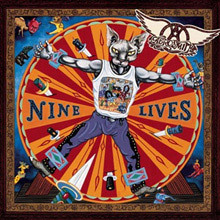 Nine Lives is the 12th studio album by American rock band Aerosmith, released March 18, 1997. 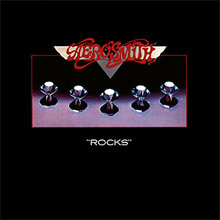 The album was produced by Aerosmith and Kevin Shirley, and was the band's first studio album released by Columbia Records since 1982's Rock in a Hard Place. It peaked at #1 at the Billboard Charts. One of the album's singles, "Pink", won a Grammy for Best Rock Performance By A Duo Or Group With Vocal. The much-ballyhooed reunion of the original Aerosmith lineup had pretty much fallen flat on its face after 1985's Done With Mirrors. Realizing that the band simply couldn't do it alone, A&R guru John Kalodner capitalized on the runaway success of Run-D.M.C. 's cover of "Walk This Way" and decided to draft in the day's top hired hands, including knob-twiddler extraordinaire Bruce Fairbairn and career-revitalizing song doctors Desmond Child and Jim Vallance. Together, they would help craft Permanent Vacation, the album which would reinvent Aerosmith as '80s and '90s superstars. Yet, despite the mostly stellar songwriting, which makes it a strong effort overall, some of the album's nooks and crannies haven't aged all that well because of Fairbairn's overwrought production, featuring an exaggerated sleekness typical of most mid-'80s pop-metal albums. Furthermore, Desmond Child's pedantic writing often compromises the timeliness of even the best material. On the other hand, pre-fab radio gems like "Rag Doll" and "Dude (Looks Like a Lady)" remain largely unassailable from a "delivering the goods" perspective. But remember kids, this is Aerosmith, so that can only mean one thing: a guaranteed number of incredible tracks for any time and place. These include the earthy voodoo blues of "St. John" and the excellent hobo-harmonica fable of "Hangman Jury." And, although some of the remaining cuts lean to the filler side, both the awkwardly Caribbean title track and the cover of the Beatles' "I'm Down" are well executed. Finally, the crowd-pleasing schmaltz of "Angel" showcases the band at the peak of its power ballad cheese. 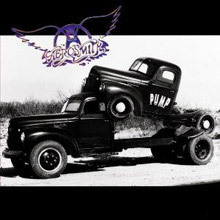 A valiant effort, this album proved to be the crucial catalyst in reintroducing Aerosmith to the masses, but if you're looking for an even better example of the band's renewed strength, check out Pump first. Where Permanent Vacation seemed a little overwhelmed by its pop concessions, Pump revels in them without ever losing sight of Aerosmith's dirty hard rock core. Which doesn't mean the record is a sellout -- "What It Takes" has more emotion and grit than any of their other power ballads; "Janie's Got a Gun" tackles more complex territory than most previous songs; and "The Other Side" and "Love in an Elevator" rock relentlessly, no matter how many horns and synths fight with the guitars. Such ambition and successful musical eclecticism make Pump rank with Rocks and Toys in the Attic. Coming on the heels of the commercially and artistically successful Pump, the fitfully entertaining Get a Grip pales against its predecessor's musical diversity. But it's not for lack of trying. 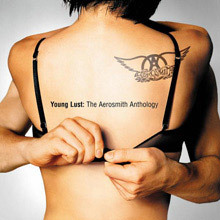 In fact, Aerosmith try too hard, making a stab at social commentary ("Livin' on the Edge") while keeping adolescent fans in their corner with their trademark raunch-rock ("Get a Grip" and "Eat the Rich"), as well as having radio-ready hit ballads ("Cryin'," "Amazing," and "Crazy"). The problem is, it's a studied performance -- it sounds like what an Aerosmith album should sound like. 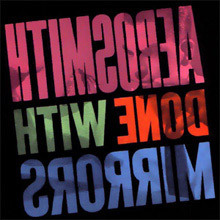 This live recording came out in 1998 and is the only album by Aerosmith receive the Parental Advisory sticker, primarily due to Steven Tyler shouting modifying some song lyrics to racier versions. All tracks are from either the Get A Grip or Nine Lives World Tours. Big Ones serves up the hits and nothing but the hits; Aerosmith's excellent debut for Geffen, Done with Mirrors, is conveniently overlooked. So what's left is some of the finest mainstream hard rock of the late '80s and early '90s -- the fruits of one of the most remarkable comebacks in rock & roll history. Given Steven Tyler's newly anointed role as America’s lecherous sweetheart thanks to his gig as an American Idol judge, it was only a matter of time before a new Aerosmith compilation hit the stores in 2011. 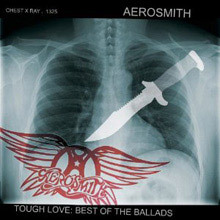 Tough Love: The Best of the Ballads arrived right on time, appearing just weeks before the close of the season, its title pitched to those AmIdol viewers who celebrate Tyler's wackiness while happily ignoring his lecherous side glances…an ignorance that would extend to the contents of this 12-track collection, as there is just no possible way that “Love in an Elevator” and “Rag Doll” could qualify as “ballads.” Instead, view Tough Love as a greatest hits of Aerosmith’s late-‘80s and early-‘90s comeback, expanded slightly by the inclusion of the granddaddy of all power ballads, “Dream On,” and the collection makes sense, as it has all the big hits -- “Angel,” “Amazing,” “Crazy,” “What It Takes,” “Livin’ on the Edge,” “Janie’s Got a Gun” -- leaving only “Dude (Looks Like a Lady)” behind. For those who fell back in love or just got to know Tyler via American Idol, this is an album designed for them. This 2001 compilation album features the band’s greatest hits of their Geffen Records years between Done with Mirrors and Get a Grip, as well as some un-released material, B-sides, and live versions. It was reissued in 2005 as Gold, with cover art of the band replaced the original cover of couple getting undressed.